Among the few "blockers" the most called are the broadcast WFM transmitters. Simple way to solve the problem is to filter the received signals using the "FM TRAP". 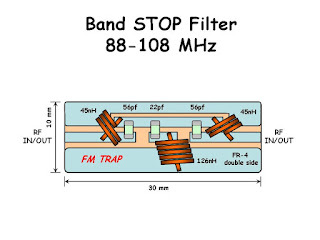 So called "FM TRAP" is nothing more than a simple Band stop filter for the frequency range of 88-108Mhz. They became really available and so cheap this days that making them at home is more time consuming then money saving. But for the guys want to learn how they are designed, and does not want to spend on the shipping filters round the globe here is the receipt and how to guide. 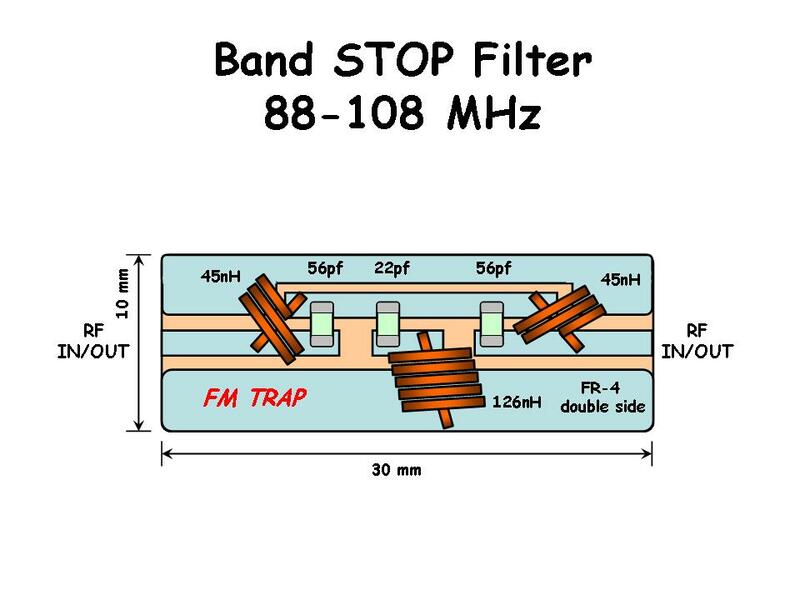 On the other hand, if you will need the band stop filter for some frequency other than FM broadcast you will know how to make it at home instead of spending the $$ on the e-bay. Basic idea was simple approach to the problem and solving the same using the freeware software and calculators. The second goal was using the standard components and values that are common and can be found easily. The coils will be wound using the magnet wire and this will reduce the cost of the filter too. At the end, you are free to use any type of the coaxial connector you prefer, so you will not depend only on the standard F-connector. Let's start. After we decide the range that we want to "block" (88-108 MHz) we need to decide how sharp or step filter we need and the attenuation in the stop band. Yeah, you probably think that there is nothing to decide, we know the FM band (88-108 MHz) If you use this corner frequencies (-3dB) in your design the attenuation of the signal at the beginning and the end of the target range will be low, just 3db, in real life even lower. As we want the uniform attenuation across the whole FM band we need to choose the wider filter range. To make the things simple, I choose the Chebyshev type filter, 3 pole, first element series with the center frequency of 100MHz and bandwidth 55Mhz with the ripple 0.1dB. Of course, the impedance should be 50 ohms or 75 ohms if your system is using 75 ohms for the standard. 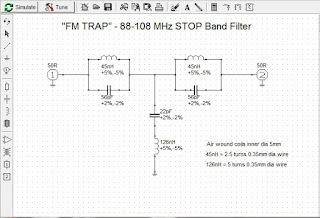 Setting the mentioned parameters on a free online web filter calculator: http://www.changpuak.ch/electronics/chebyshev_bandstop.php and pressing the calculate the results will appear in the lower window. The required capacitors are 2x 56pF and 1x 20pf. 56pf is the standard value while the 20pf is not. Instead of 20pF you may use the 18pf or 22pf or two parallel 10pF. I used 22pF in my project. It is smart idea to check the stop band frequency characteristic and the other performance of calculated filter before taking the soldering iron in hands. Free software that can do that is the RFSim99 that can be found on the web. No installation is required, just running the exe file. Let's draw our filter and simulate it. The result is really good, but only in the perfect world. In the real world the attenuation in the stop band will not be so deep but the curve can give us idea how wide the filter will be and the center frequency. We can tweak the capacitor/inductance values to tune the response of the filter, but calculated values will give us the best results. Once we are good with the design we can build the filter. I used double sided FR-4 laminate 1.6mm thick but the others are good too. The PCB is just 1cmx3cm and the traces were cut using the exacto knife. Instead of the SMD type capacitor, the standard lumped parts may be used hence the bigger size PCB and complete filter. The filter can be even made without PCB, all parts soldered in the air style inside the metal container and coaxial connectors. If you stick to the calculated values the filter should be very close to the design and no tuning should be required. If you have the possibility to measure the filter on some network analyzer then you can tweak the filter to the required response as I did. I stretch the center coil (5 turns) a bit to obtain uniform attenuation across the required range (at least 30dB) rather than having on some frequencies attenuation of 50dB and a bit lower not more than 25dB. Obtained result can be seen on the following photo. The -3dB stop band range is from 79.5Mhz to 123.3MHz. The -10dB stop band range is from 85MHz to 119MHz. The attenuation on the required range 88MHz-108MHz is 30dB or better with the maximum attenuation of -44.6dB at 103.4MHz. If you compare this results with the design done in the RFSim99 simulator the figures are lower but the shape of the filter is the same. This is to be expected due to simple simulation paradigm used and no electromagnetic simulation. More accurate predictions and calculations are possible using very expensive software and this is not the scope of this post. To recapitulate done, we designed the 3 pole stop band filter with the attenuation of 30dB plus in the range of 88-108MHz. The attenuation outside the designed range is really low, where the insertion losses up to 1.7Ghz are bellow 1dB and flat response over the range as can be seen from the lower picture. 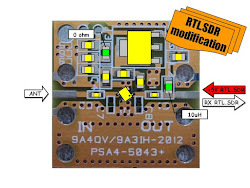 Designing filters using the lumped elements can work up to 500Mhz. Anything above that will be difficult to create using the lumped elements where instead the micro-strip line technology or some other approach should be used. Good luck and have fun with building the filters. Any chance a similar result can be accomplished by using ceramic disc capacitors? I just happen to have those in excess. Disc capacitors work just fine, unless you are interested in passing frequencies above 500MHz. Then SMD works better. One note: the filter can be optimized a bit if you know the band of interest. For example, it is possible to achieve a somewhat sharper transition on the high side, if you are interested in monitoring 118-138MHz air band and don't mind frequencies below 88MHz to suffer from some attenuation. I did this adjustment by spreading the coils with a dielectric stick while monitoring the response. I'm trying to use the RTL dongle to receive AIS messages on 161.975 and 162.025 MHz and want to copy your FM trap. Because I want to Use this on my boat I want to have only one little enclosure. Would a be a good idea to install the STICK and the FM TRAP in the same shielded enclosure???? Do I need to separate the stick and the trap with shielding??? What type of equipment do you use to provide the measurements shown in your post. Ernie, in the past I do remember the same problems with the analog TV too. We cure that problem in our club simply by inserting a coaxial open stub filters at the TV input. The stub were cut to meet the quarter wavelength on 2m. (Do not forget the velocity factor) Two stubs did solve the problem. If this is not enough, extra stub can be inserted also on the 2m radio but this time calculated to meet the 2nd, 3rd or higher order harmonics, depending the TV channel you have a problem. Of course, the commercially designed filter can help too, but I think that most of the problems may be solved using just the coaxial stubs. I think that this solution is published in some UK or USA handbooks. Hello, I've made an attempt but not seems to be working at all. I would like some help since do not have access to testing equipment. I could not find a link to post photo. I mounted inside a altoids can with sma connectors and airstyle soldering. The coils were made of awg copper wire, I thought it would stand in place better than thin transformer wire. The ceramic capacitors are 33 and 15 pf. The coils were rolled around drills and used thinner drills to set spacing between turns. Any clues? I simulate your filter by the declared values and the filter should be OK. The stopband is abit wider then mine but this is OK. Maybe the cause are coils. I do not know if your designed coils are up to calculated value. Thanks for the answer, I will try to adjust the coils, there must be something wrong. The 3mm gap was too tight, It is working now. Should I expect to supress completely the FM Band signal? I´m Getting the following attenuation checking only RTL AGC on SDR# config. Did not notice FM imaging anymore. How much is the FM stop band filter please ? Are you sick and tired from looking for bitcoin faucets? YoBit lets you to claim FREE CRYPTO-COINS from over 100 different crypto-currencies, you complete a captcha once and claim as much as coins you want from the available offers. You can click on claim as much as 30 times per one captcha. The coins will stored in your account, and you can exchange them to Bitcoins or Dollars. Did you think about picking the ultimate Bitcoin exchange service - YoBit. If you are looking to buy bitcoins online, PAXFUL is the best source for bitcoins as it allows buying bitcoins by 100's of different payment methods, such as Western Union, MoneyGram, PayPal, Visa, MasterCard, American Express and they even allow exchanging your gift cards for bitcoins. Invest in Ripple on eToro the World's Leading Social Trading Network!!! Join 1,000,000's who have already found easier methods for investing in Ripple. Learn from established eToro traders or copy their positions automatically! There might be some problem with the frequency. Hope the bands are connected in well manner. Basic idea was simple approach to the problem and solving the same using the freeware software and calculators. 3 Euro extra for Bias-T 3.3-5V mod. Do you need a box / boxed LNA? Made in aluminum, good for LNA4ALL and the LNA4HF. KIT form with all screws, 2x SMA connectors and feed-trough capacitor.